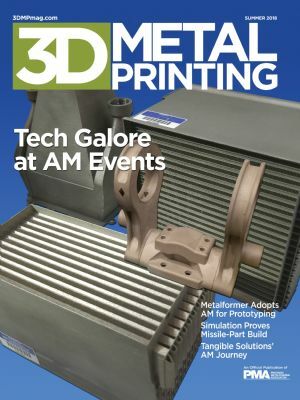 At FABTECH, November 6-8 in Atlanta, GA, Check out the 3D/Additive Manufacturing pavilion, located in Georgia World Congress Center Hall B, and stop by to visit 3D Metal Printing magazine, published by the Precision Metalforming Association, at Booth B5635. In its second year as part of FABTECH, the pavilion promotes additive-manufacturing (AM) prototype and part production as well as production of workholding devices and production tools. Visit exhibitors showcasing printing machines, hybrid equipment, materials, software and other AM-related products and services. The Knowledge Bar, held in the 3D/Additive Manufacturing Pavilion, features small group sessions where attendees can ask questions about specific AM challenges and find out what's new from industry experts. These sessions, presentation-free, are all about engaging with knowledgeable people, working through challenges and meeting specific information needs. For the latest on exhibitors, technologies and presentations slated for the 3D/Additive Manufacturing pavilion, visit www.fabtechexpo.com. Forecast 3D, a Carlsbad, CA, provider of custom manufacturing and 3D-printing services, is celebrating Manufacturing Day on October 5 with a tour of its 3D Manufacturing Center. The event includes guest speakers from HP Inc. Forecast 3D hosts a slew of HP 3D-printing machines and serves as HP's Experience Center in the United States. Created in 2012, Manufacturing Day is designed to address common misperceptions about manufacturing by giving manufacturers an opportunity to open their doors and show what manufacturing is–and what it isn't. The goal of Manufacturing Day: Help manufacturers address the skilled labor shortage, connect with future generations, take charge of the public image of manufacturing, and ensure the ongoing prosperity of the whole industry. On the hunt for more 3D printing information? 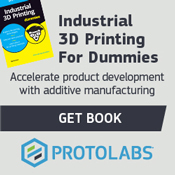 Check out "Industrial 3D Printing for Dummies." It's filled with facts, figures, and recommendations that will help you improve product development with additive manufacturing. Request your free dummies book now! 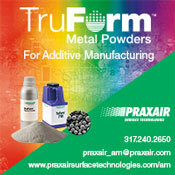 With Praxair Surface Technologies powders, the sky isn't the limit. TruForm Metal Powders allow you to dream big. Our aerospace-grade powders can be customized and are available in large lot sizes and R&D volumes. Contact us to find out how we are making more possible. Centerline Engineered Solutions, a Greenwood, SC, contract engineering and fabrication business, has expanded its portfolio to include 3D-printing consulting, designing and manufacturing services for customer parts, tooling and prototypes, using metal and nonmetal base materials. Through its purchase of a Markforged Mark Two desktop printer, capable of 3D printing with plastics, and also with continuous carbon-fiber reinforcement, the company was able to produce press-brake tooling. The tooling cost less than $200 to print, according to Centerline officials, representing an 86-percent reduction in costs for the customer as compared to a conventionally manufactured tools. Not only that, the quick print work reduced project lead time by 88 percent. Read more. When this year's Oktoberfest kicked off a couple of weeks ago in Germany, the AddWorks team at the GE Additive Customer Experience Center (CEC) in Munich tasked itself with rethinking the traditional glass beer krug. 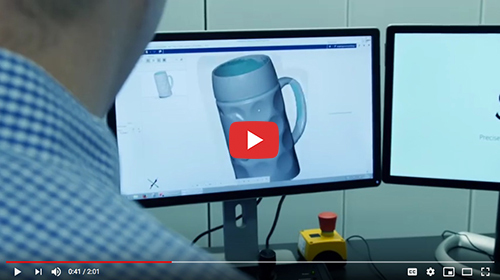 To solve the problem of breakage, the team used a combination of titanium and stainless steel to create an attractive and durable prototype, as demonstrated by Matthew Beaumont, head of CEC. In developing a vehicle to better handle varying terrain, DARPA the Defense Advanced Research Projects Agency, has leveraged the unique capabilities of AM for certain parts. Check out these wheels, which can transform to tracks within 2 sec. Q. How do you qualify an additive manufacturing (AM) machine? A. The process of machine qualification covers various topics to ensure performance, which again can change due to industry and applications. The strategy for qualification needs should be documented and revision-controlled within the company's standard work and procedures. Read more. Seeking Your Questions: The rapidly evolving world of additive manufacturing is filled with questions, and we want yours. In her Additive Manufacturing Q&A column, Caitlin Oswald employs extensive experience and expertise to clarify issues surrounding the technology and its processes, and provides answers you can use. E-mail your questions for Oswald to Brad Kuvin, 3D Metal Printing publisher/editorial director, at bkuvin@pma.org. Solar Atmospheres provides commercial vacuum heat treating services for 3D Metal Printing technologies. Our vacuum furnaces can produce the critical temperature uniformity (+2°F) when needed and the vital heating and cooling data by thermocoupling parts directly. Solar operates plants in Pennsylvania, South Carolina, and California. Achieving the proper AM build orientation is quite a trick. In fact, often there is no "right" orientation, only an optimized solution with tradeoffs made along the way. To tackle the orientation issue, and how it impacts thermal distortion, 3D Metal Printing talked with Scott Volk, chief technology officer for Incodema3D, Freeville, NY. Scientists at the Department of Energy's SLAC National Accelerator Laboratory in Menlo Park, CA, are using X-ray light to observe and better understand 3D metal-printing processes in order to help manufacturers quickly build reliable parts in factories, on ships or planes, and in space. 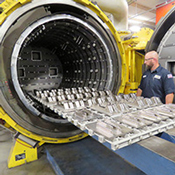 ☉ Material Testing Key to AM Quality Management—Testing machines and software pay off big time for manufacturers of aerospace parts, and for the makers of the machines used to print them. ☉ Formnext: AM Takes Center Stage in Frankfurt—Frankfurt, Germany, is the place to be for AM professionals, as formnext 2018, the largest AM event in the world, kicks off November 13.